The 2013 North American International Auto Show in Detroit’s Cobo Hall is expected to be a biggie in terms of new model debuts and among those new model introductions will be the new Lexus IS – with an entirely redesigned look drawing much of its styling inspiration from the sporty Lexus LF-CC Concept. Over the past year, Toyota’s premium Lexus brand has introduced redesigned versions of their ES, GS and LS sedans so it only makes sense that it is time for the smaller IS lineup to get a refresh of its own. Nothing is known right now about the next generation Lexus IS but from the brief statement announcing that the sporty sedan would be making its debut on January 15th at the 2013 North American International Auto Show in Detroit, we have some ideas about the direction that the company will head with their popular IS lineup. 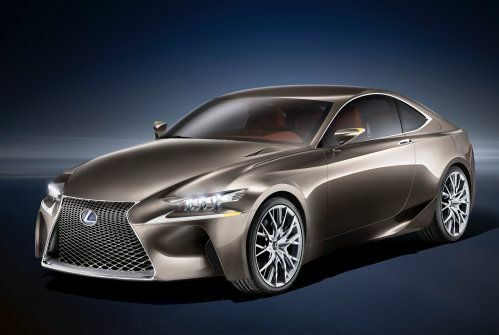 Considering the timing for the introduction, I am guessing that this will be the 2014 Lexus IS sedan. All of the other new Lexus models share the distinct spindle grille design and the company has done a great job of applying that large, aggressive front end to the ES, GS and LS sedans. This is a feature that we can most certainly expect to see on the 2014 Lexus IS sedan but based on company comments, the new IS will likely feature the boldest and most aggressive application of the spindle grille thus far thanks to some of the design inspiration borrowed from the recent Lexus LF-CC sport coupe concept (shown above on the right) as well design cues taken from the Lexus LFA supercar. The part about the LFA design cues really caught our attention and that really makes the imagination go crazy as to what we might see in Detroit. Interestingly, when you look at the Lexus LFA and the Lexus LF-CC Concept – two cars from which the 2014 Lexus IS are said to have taken some of its design inspiration – you have two very different looks. The LF-CC Concept wears the massive spindle grille and the long front end area that we are expecting to see on the next generation IS but the LFA takes a much more classic approach to exterior design…most notably excluding the spindle grille. We would normally expect that the 2014 IS would have some more production friendly versions of the headlights from the LF-CC with multiple HID projection housing tucked under a solid lens, presenting an angry looking “brow” design much like the other models in the current lineup. However, the LFA again has a completely different design layout across the front with a countenance is unique its own. In short, it is seemingly impossible for the next generation Lexus IS to look like the LF-CC and the LFA since the two are so different. Then again, maybe Lexus has found a way and they will prove me wrong when the new IS makes its debut in Detroit’s Cobo Hall in a little over a month’s time. Lexus has promised that the next generation IS will debut with a completely redesigned look inside and out – although there is no mention of what to expect along the lines of new drivetrain components. The IS has clearly become the affordable sport model of the lineup, ranking just under the likes of the newly sported-up GS350, so we should expect it to offer slightly less power in standard form although we should also expect a high performance F Sport model in the near future – along with a convertible, a coupe joining the sporty sedan.